On March 21, 2014, President Obama signed the Homeowner Flood Insurance Affordability Act of 2014 into law. This law repeals and modifies certain provisions of the Biggert-Waters Flood Insurance Reform Act, which was enacted in 2012, and makes additional program changes to other aspects of the program not covered by that Act. Many provisions of the Biggert-Waters Flood Insurance Reform Act remain and are still being implemented. While FEMA actively works to implement the new law, we encourage policyholders to maintain and keep current flood insurance policies. FEMA does NOT recommend cancelling a flood insurance policy. Cancelling flood insurance policies now will leave policyholders unprotected during spring flooding and may cause policyholders to lose important discounts on their rate if they reinstate in the future. A fact sheet about the Homeowner Flood Insurance Affordability Act of 2014. This law repeals and modifies certain provisions of the Biggert-Waters Flood Insurance Reform Act and makes additional program changes to other aspects of the National Flood Insurance Program. The National Flood Insurance Program (NFIP) is in the process of implementing Congressionally mandated reforms required by the Homeowner Flood Insurance Affordability Act of 2014 that repeal and modify the Biggert-Waters Flood Insurance Reform Act of 2012 (BW-12). This fact sheet provides an overview of the changes to flood insurance rates under the NFIP. While the new law is implemented, policyholders are encouraged to maintain and keep their current flood insurance policies. Allowing policies to lapse will leave policyholders unprotected. Policyholders who have questions about their flood insurance policies should contact their insurance agent. This presentation is intended to provide information regarding the impacts of new legislation called the Homeowner Flood Insurance Affordability Act of 2014, and changes to the National Flood Insurance Program (NFIP), which include the previously passed reform legislation called the Biggert-Waters Flood Insurance Reform Act of 2012. This fact sheet provides an overview of the changes business owners should expect, as the National Flood Insurance Program (NFIP) implements reforms as required by the Homeowner Flood Insurance Affordability Act of 2014 and the Biggert-Waters Flood Insurance Reform Act of 2012 (Biggert-Waters). The National Flood Insurance Program (NFIP) is in the process of implementing Congressionally mandated reforms required by the Homeowner Flood Insurance Affordability Act of 2014 (HFIAA) that repeal and modify the Biggert- Waters Flood Insurance Reform Act of 2012 (Biggert-Waters). 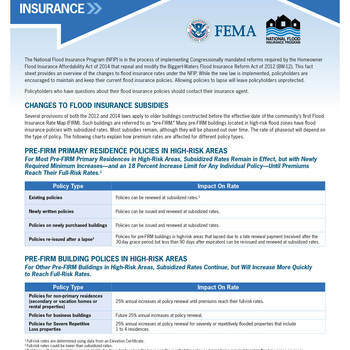 Flood insurance rates and other charges will be revised for new or existing policies beginning on April 1, 2015 and a summary of those changes are included in this fact sheet. The National Flood Insurance Program (NFIP) policy now includes a new congressionally mandated annual surcharge required by the Homeowner Flood Insurance Affordability Act of 2014 (HFIAA). This fact sheet is intended to educate policyholders on the amount of surcharge that is being applied to their policy and why, how to ensure they are being applied the appropriate surcharge, and who to contact for more information. On November 1, 2015, the National Flood Insurance Program (NFIP) began collecting additional information about non-residential properties in order to separate business buildings from other non-residential buildings. The additional information allows the NFIP to phase out subsidies for business buildings more quickly, as required by recent NFIP reform legislation. This fact sheet details changes affecting your non-residential book of business, and suggests ways to help your business clients save on flood insurance. Whether you are a tenant or a building owner, a flood can devastate your business. You can reduce your risk of losing your business due to flooding with a flood insurance policy. This fact sheet explains what business owners need to know about flood insurance. Learning that a new Flood Insurance Rate Map (FIRM) shows their home or business at a higher risk than before can be stressful and costly for your clients. But rating options to help ease the financial impact are available. One option available through the National Flood Insurance Program (NFIP) is the Newly Mapped procedure. This fact sheet explains the Newly Mapped procedure for your clients. Peace of mind comes from knowing your clients’ most valuable investment—their home or business— is protected from the high cost of flooding. This fact sheet details four reasons your clients should renew their flood insurance polciy each year.